The fourth quarter of 2018 saw the Occupational Safety and Health Administration propose hefty penalties for several construction companies. In fact, the agency fined just one contractor alone more than $420,000. Nevertheless, the following contractors, fined and cited in 2018, still have plenty of agency red tape to deal with ahead, as well as the possibility they will have to pay significant penalties. Heavy civil construction contractor RKM Utility Services’ employees were working on a Dallas, Texas, project site when one individual, who was working in a trench, died after being exposed to unsafe levels of hydrogen sulfide, according to an OSHA press release. 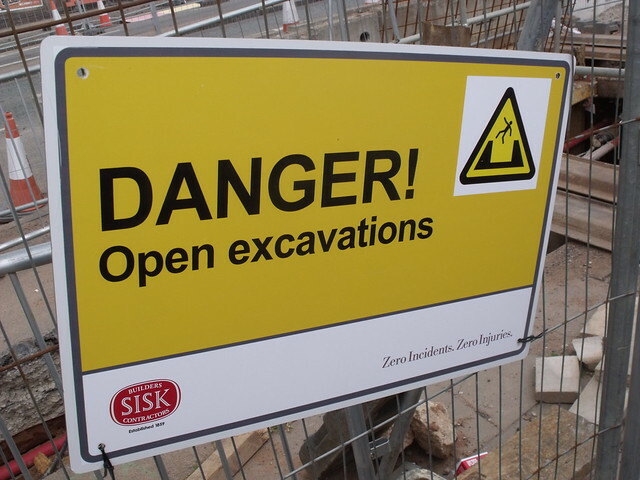 The citations related to safety — and totaling $150,400 in proposed penalties — included one willful and three serious violations for not protecting employees from falling through holes higher than 6 feet from ground level by providing them with adequate fall protection; not having engineering data onsite when building a trench box; allowing employees to work in an excavation that was greater than 2 feet below the bottom of a shield and permitting employees to work in an excavation without a means to remove accumulated water. OSHA also issued one serious and three willful health-related violations to RMK, and those proposed fines totaled $271,606. The agency said the contractor did not advise employees about potentially unsafe conditions or how to avoid them; allowed employees to be exposed to levels of hydrogen sulfide above the threshold limit of 10 ppm; did not test the air in the trench, which was deeper than 4 feet, for hydrogen sulfide and oxygen levels; and did not keep emergency rescue and breathing equipment readily available. After OSHA investigators inspected the Johnstown, Pennsylvania, site where one employee was fatally electrocuted and two others injured while repairing a sewer, the agency issued Insight Pipe Contracting two sets of citations, one with fines totaling $113,816 and the other for $217,285, outlining two serious and three willful violations. OSHA determined that Insight failed to establish adequate procedures for entering a confined space; did not train employees about the hazards associated with entering, exiting or working in confined spaces; failed to conduct atmospheric testing before allowing employees to enter the sewer line; did not use a retrieval line and did not have the proper permits. Leominster, Massachusetts-based Northeast Framing found itself on the receiving end of fines totaling $311,330, as well as seven serious, two other-than-serious and two willful violations after one of the contractor’s workers fell to his death at an East Boston jobsite. OSHA investigators determined that Northeast Framing did not check the jobsite for hazards or train its employees to do so; failed to remove debris that could potentially lead to employee injury; exposed workers to falls up to 32 feet; did not train employees on how to recognize and avoid fall hazards and did not provide them with fall protection; exposed workers to struck-by and ladder hazards; and did not report the death of its employee in a timely manner. Turnkey Construction Planners is yet another roofing contractor that OSHA determined was in violation of fall protection standards. The agency said it inspected two of the company’s jobsites in Port St. Lucie, Florida, as part of its Regional Emphasis Program on Falls in Construction and found Turnkey employees in both locations working without fall protection. OSHA said at the time that it had cited Turnkey four times before for similar infractions. The agency issued Turnkey citations for two repeat violations, claiming that, in addition to a lack of fall protection, its employees were exposed to falls of greater than 8 feet on one jobsite and 10 feet on the other. OSHA found MHJ Contracting violated the agency’s fall protection standards and issued the company citations for two serious and three willful violations. OSHA investigators determined that Madeira Framing violated fall protection standards and issued the contractor citations for one serious and four willful violations, proposing total fines of $157,993. An employee of utility contractor Mark Lee and Yong Kay died after being struck in the head by a linear rail, part of the shoring system in a trench. The crew was trying to lift the rail with a backhoe when a safety latch broke and the rail fell. Through the state's Division of Occupational Safety and Health, also known as Cal/OSHA, which uses a state plan approved by federal OSHA, the contractor was issued citations for nine violations — three serious, five other-than-serious and one willful. The largest portion of the penalty was $94,500 for failing to remove support systems in a way that kept employees from being injured. Other violations included failing to use hoisting equipment according to the manufacturer’s instructions; not conducting daily inspections; failing to provide adequate training for employees working in excavations; and allowing workers to remain in a trench while support systems were being removed. OSHA cited Kasper Roofing & Construction, based in Windermere, Florida, for fall protection violations after an employee fell to his death on a jobsite in Maitland, Florida. The agency also proposed a fine of $134,510 for one serious, one other-than-serious and one willful violation. OSHA said Kasper did not provide sufficient training for employees who would be exposed to fall hazards on the job; failed to conduct regular inspections in order to ensure employees were using fall protection while working; and allowed employees to work at heights in excess of 10 feet without a guardrail, safety net, personal fall arrest system or other acceptable fall protection devices. The agency cited Crown Roofing in November and proposed fines of $129,336 for exposing its employees to fall hazards, and more specifically for allowing employees to perform roofing work without fall protection in place. OSHA said it had previously cited Crown 13 times since 2014 for fall hazards. OSHA also cited Crown Roofing in the third quarter for fall-related violations, and the contractor notified the agency that it intended to either comply with the violated standards or eliminate the hazards associated with the violations through abatement. The company also has a plan in place to pay a fine of $90,535 for those violations, negotiated down from $135,434.